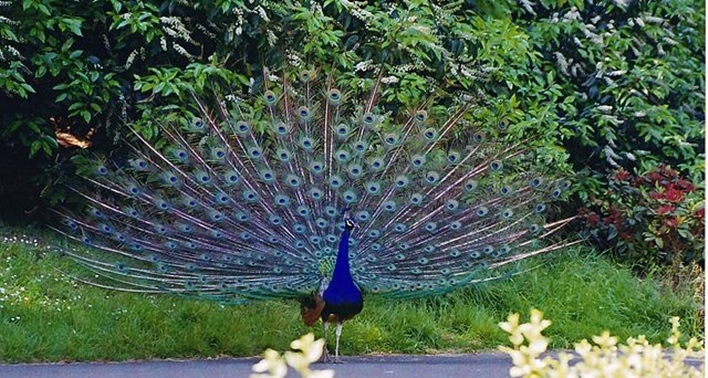 Bankapura Peacock Sanctuary is a well-known peacock sanctuary located in the State of Karnataka. It is one of the lesser known destinations in Karnataka. The Bankapura peacock sanctuary is located inside the Bankapura Fort, which lies in Bankapura of the Haveri district. It has an area of 139 acres of land and is only 2.5 kms from the Pune Bangalore highway. It is at a distance of 22 kms from Haveri towards Hubli. The sanctuary is well connected by road network. This sanctuary has high significance for being the second sanctuary in the country that is exclusively involved in the conversation and breeding of peacocks. The Department of Veterinary Studies conducts various research and studies at the sanctuary. Bankapura Peacock Sanctuary is located on a cattle breeding farm which has an area of 90 acres out of the total 139 acres in the sanctuary. Fodder is grown exclusively for the Khillari cattle and it has become an ideal peafowl habitat. Maize, jowar and horse gram are grown for the cattle. Eucalyptus plantation is widespread across the area and a shrub forest is also found here. It is estimated that there are more than 1000 peacocks and peahen in this sanctuary. It has become easier for breeding because of the minimal human intervention. Peacocks have a large area of 4 kms to royally walk inside the mound. You will also be able to see a variety of other birds apart from peacocks. These include Indian robin, blue tailed bee eater, tailor bird, robin, Nightjar, woodpecker, winged kite, grey hornbill, spotted dove, great-horned owl, parakeets, paradise flycatcher and many more. If you happen to visit the sanctuary, you will not return without a sight of a flock of peacocks enjoying themselves in this area. Although you can visit this sanctuary at any time during the year, the best period considered is October to April. The best time to visit is in the early hours of the day. The nearest airport to the sanctuary is Bellary which lies at a distance of 119 kms from Haveri. Haveri is conveniently connected with metros by rail. There are regular trains from Mumbai, Bangalore, and Chennai. It takes about 7 hours to reach Haveri from Bangalore by train. There is a well-connected road network that links Haveri to the other cities. It is located on the NH-4 which heads towards Mumbai. The sanctuary lies at a distance of 22 kms from Haveri towards Hubli.